4th - Tucson's rank in patents out of 12 comparison regions. Business growth in the Tucson Metropolitan Statistical Area (MSA) accelerated to 0.5% in 2017. That was a full percentage point higher than the previous year. However, Tucson ranked low among its peer western MSAs in 10th place. Despite the low ranking, the increase was a considerable improvement over the substantial decline during the Great Recession. Since then, business growth, or the growth rate in total establishments, has fluctuated annually but experienced an overall upward trend. The change in the total number of establishments reflects the dynamism of the local economy, as well as the overall ups and downs associated with business cycles. Local areas with strong business growth may generate correspondingly strong gains in jobs and income that contribute to increases in the standard of living and the tax base. 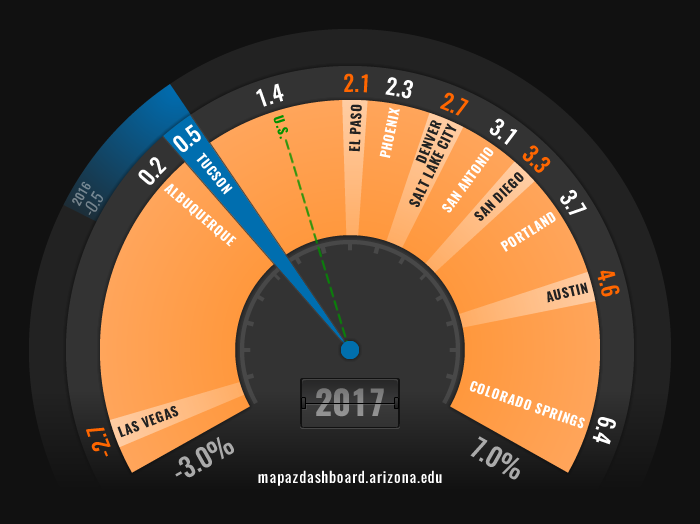 According to the latest data on business starts, professional and business services generated the most new businesses in the Tucson MSA (18.8% of the total), followed by trade, transportation, and utilities (16.8%); education and health services (16.7%); and financial activities (14.1%). Manufacturing; information; and natural resources and mining generated far fewer new businesses. Slow gains in manufacturing and natural resources and mining reflect, in part, the capital-intensive nature of these sectors, which make industry entry and exit relatively expensive. Tucson’s business growth rate at 0.5% underperformed the state’s rate of 3.5% and the national rate of 1.4%. Business growth remains well below pre-recession levels for the state of Arizona and the Tucson MSA. However, since the Great Recession, Tucson and the state of Arizona have experienced an overall increase in the growth rate in total establishments. To explore starts, closures, expansions, and contractions for the U.S., western states, Arizona counties, and comparison MSAs visit the Comparison Page. Business growth reflects changes in the number of establishments. An establishment is a single physical location at which business is conducted or services or industrial operations are performed. It is not necessarily identical with a company or enterprise, which may consist of one or more establishments. When two or more activities are carried on at a single location under a single ownership, all activities generally are grouped together as a single establishment. The entire establishment is classified on the basis of its major activity and all data are included in that classification. Estimates for the number of establishments come from the Quarterly Census of Employment and Wages (QCEW), a quarterly dataset maintained by the Bureau of Labor Statistics (BLS). QCEW data are obtained primarily from state unemployment insurance programs. The QCEW captures approximately 97% of all wage and salary civilian employment in the county. The data exclude those not covered by unemployment insurance: self-employed workers, most agricultural workers on small farms, all members of the Armed Forces, elected officials in most states, most employees of railroads, some domestic workers, most student workers at schools, and employees of certain small nonprofit organizations (BLS, Quarterly Census of Employment and Wages Frequently Asked Questions). Estimates of business starts, expansions, contractions, and closures come from Statistics of U.S. Businesses (SUSB), an annual datasets maintained by the U.S. Census Bureau and extracted from the Business Register. This datasets cover businesses that generate most of the country's economic activity. The data exclude non-employer businesses, private households, railroads, agricultural production, and most government entities.